Here in Australia we have so many great things. The Great Australian Bight, The Great Barrier Reef, even Great White Sharks! Well now you can add the Great Census Fail to that list. The Australian Government failed miserably with the census this time around. So much that a Twitter hashtag #CensusFail was trending throughout the day and night on August 9. If you have a Twitter account do check it out as it’s quite amusing. On a more serious note the Australian Government has issued a statement on the Census website, which even at the time this was published, is still unavailable. 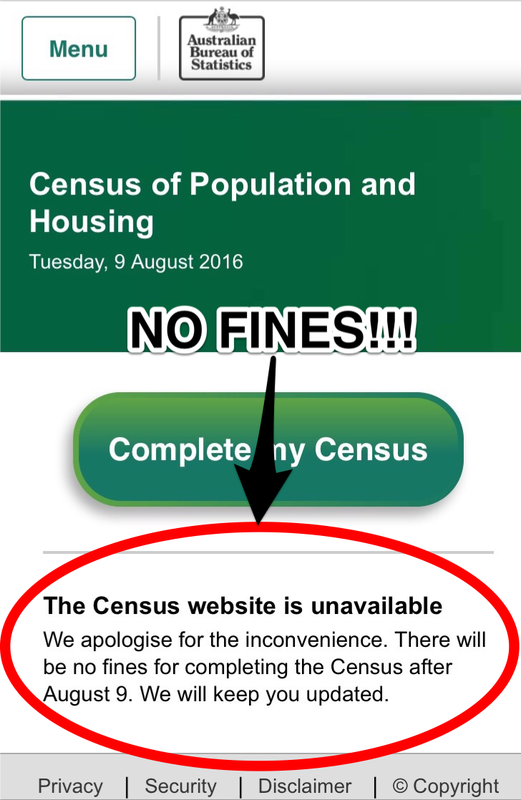 The federal government via the Australian Bureau of Statistics (ABS) is letting everyone know that there will be no fines for not completing the census after August 9. Isn’t that nice of them? What they’re not telling you is that they cannot fine you for not completing their request for information in the first place. And that their threats of fines are merely another coercion tactic that the Australian Government so frequently uses to make the population bend to their will. Simply look up No Jab – No Pay. The Census and Statistics Act only gives the Statistician the power to REQUEST that a person fill up a form or answer questions (e.g. a Census or one of their periodic surveys). The Act does have penalty provisions, but these are not directly connected to filling out the Census form on Census night or answering questions when a collector knocks on your door. There are no penalties for refusing a REQUEST to fill out a form. If you refuse the Statistician’s request he/she then has the power to DIRECT you to fill out the Census form or answer survey questions but he/she can only do that after you have refused his REQUEST per sections 10(4) or 11(3) of the Act. To direct you to fill out a form there is a strict legal process which the Statistician must comply with. The process is this: The Statistician must serve a formal, legally defined “Notice of Direction” in writing on you if you refuse his request. • It must be in writing. • It must DIRECT you to fill out the form or provide answers to survey questions. If you don’t comply with a (genuine) “Notice of Direction”, the Statistician can take you to court and a magistrate can impose heavy fines. The Statistician cannot impose a fine. The penalties in the Census and Statistics Act are for refusing a direction. Again, There are no penalties for refusing a request for information. This is important. If you refuse a request for information (as is your legal right) and you subsequently receive a (genuine) “Notice of Direction” then you must give them the information they want or you will be fined. However, you do not have to give them your name, or the names of any people in your house unless you are directed to do so in a Notice of Direction. But, if they don’t have your name then they can’t issue a Notice of Direction to you! The Bureau of Statistics does not like to issue a “Notice of Direction” to respondents as they like to claim that all respondents “willingly complied” with their request for information (regardless of how much angst their intrusive surveys caused to their hapless victims or whether their respondents only acted under duress). To avoid issuing Notices of Direction, they resort to dishonest tactics by sending letters to anyone who refuses their demands. These letters purport to be formal Notices of Direction, but in reality they are a dishonest bluff tactic which the Bureau uses to extract information under false pretences. If a letter is not a genuine Notice of Direction (i.e. it does not meet all of the conditions listed above) then it can be ignored. If you receive a letter from the ABS, ask them to confirm, in writing, that it is a formal “Notice of Direction” in accordance with the Census and Statistics Act. The ABS may also resort to harassment tactics and bureaucratic thuggery by sending more senior officers to you home to “persuade” you to give them the information that they want. Ignore these people. If they are not collectors seeking information and they are not delivering a (genuine) Notice of Direction then they have no authority to come to your home or to request information from you. The Australian Government has once again proven it’s incompetence and played the blame game over its failure. “Russian hackers” apparently. So now that you know you won’t be fined, will you even bother completing it?